In this Forbidden Desert board game review, we will take a look at another solid creation by Matt Leacock, the man behind games such as Pandemic and Forbidden Island. Is it as good as those games, though? Read on to find out. Forbidden Desert is an adventure co-op board game that has you attempt to recover a legendary flying machine that is in the ruins of a desert. You have to work with your teammates in order to use the resources around you to survive the desert and everything that it throws at you. The goal of Forbidden Desert is simple: get the flying machine’s parts and get out alive! At the start of Forbidden Desert, each player chooses their own character with a unique set of powers. The board tiles are then set up with an empty space in the center. Players start with their pieces on the crash landing tile and they begin to play. A player can take up to four actions per turn and they need to draw a storm card equal to the current sandstorm level. Players’ actions are: move, remove sand, excavate or pick up a part. Storm cards are all bad for players, but they will vary in their degree of difficulty. Most of these cards cause the storm to move on the board, while the other cards increase the storm levels or make the sun beat down on the players. Players can lose their water as a result of the sun beating down on them, which is obviously never a good thing. Beating Forbidden Desert requires getting all of the pieces of the flying machine and flying out of the area alive. You can lose by having a player die of thirst, running out of sand markers, or being swept away by the storm. That should give you a good feel for how the game plays, but you can check out the official Forbidden Desert rulebook (PDF) for a more complete explanation of the rules. This game is super challenging, which is great because it definitely is winnable. Forbidden Island can be easy for people who are used to these types of games, but Desert’s puzzle is usually tough to solve even on the Normal difficulty level. Forbidden Desert is a juggling act, but that is something that makes the game a lot of fun. You want to go get the pieces of the flying machine, but you might have to clear out some extra sand to help out the team. Forbidden Desert also requires a higher degree of teamwork. You have to talk about when to use the equipment, which direction everyone is going to go, and how everyone is going to have enough water to survive. I really like the look of this game. The sand looks really cool on the tiles, the artwork on the tiles is nice, and the flying machine has a great look to it. I definitely prefer playing Forbidden Desert has a 3+ player game. Two-player games seem extremely difficult; I didn’t even come close to winning in four two-player games. You’ll have more special abilities with more players and you’ll be covering more of the board. There are a lot of moving parts in this game, so people who aren’t into puzzle games may not be fans of this one. For us, Forbidden Desert isn’t quite as good as Pandemic, but it is a step up from Forbidden Island (though we still own and play all three). 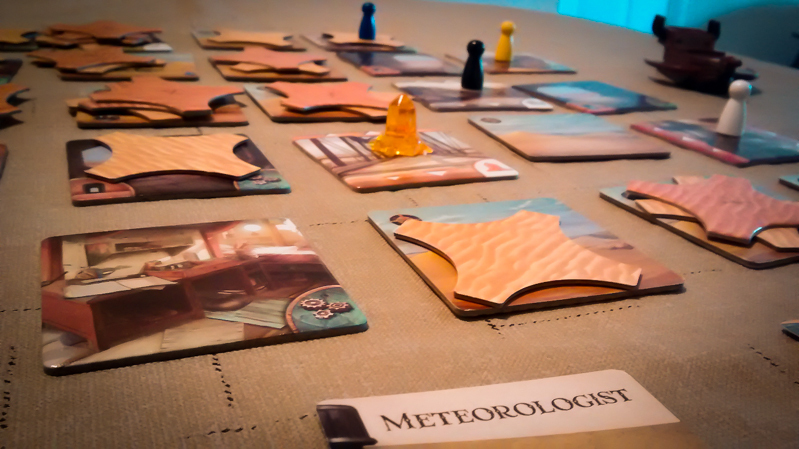 The Forbidden Desert tiles and cards are designed beautifully, and each game will be a bit different from the last. 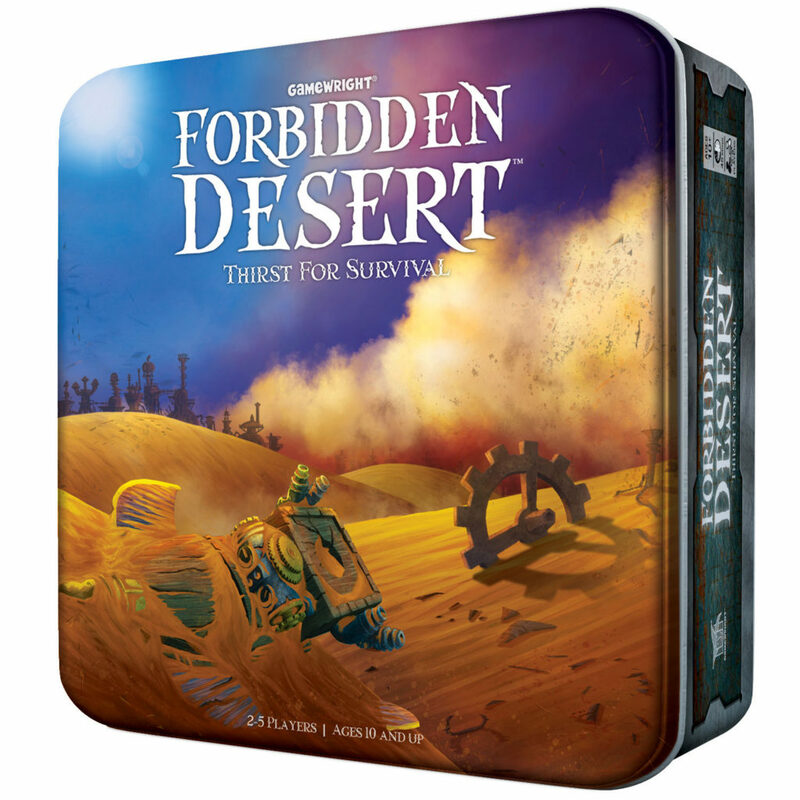 They haven’t even had to make a Forbidden Desert expansion since there is plenty of replay value in the original tin. It is a great choice for anyone who is interested in owning a quick and challenging cooperative game. If you want to test out the game, be sure to download the Forbidden Desert app for iOS. Thanks for taking the time to read our Forbidden Desert board game review!